Samsung’s newest smartphone, the GS4 Active, is a waterproof phone that stands out from its counterparts on the smartphone market. One factor that makes the GS4 Active stand out is its waterproof certification: most high-end smartphones do not come with waterproof capabilities built in, and, of those that do, only a few provide real protection against the marine environment. Of those that apply water protection, the GS4 Active provides better waterproof protection than most waterproof smartphones available. Only Sony’s Xperia Z matches Samsung in its ingress protection (IP) rating. While Verizon is not broadcasting this new proposal, the site WireFly is. Wirefly announced the Liquipel-coated GS3 last week, telling customers at the site that it could be theirs for $89.99 with a two-year contract with Verizon Wireless. Liquipel is a coating that iPhone users often place on their iPhones to ensure water protection, but Samsung’s recent GS4 Active has many GS3 users feeling neglected or left out because their smartphones are not waterproof. The GS3 comes with a dual-core, Qualcomm Snapdragon S4, 1.5Ghz processor, 1280 x 720p screen resolution, 720p video recording, 4.8-inch, super AMOLED display, 1GB of RAM, a 1.9MP front-facing camera, 2MP rear-facing camera, and running Android 4.0 Ice Cream Sandwich. For those who want the latest, Samsung will allow you to download the Android 4.1.2 Jelly Bean update after you purchase the phone. According to recent rumors, Android 4.2.2 Jelly Bean will be available in either July or August, so you can expect to buy this phone and have the latest and greatest soon. Between multi-window mode, a 3D photo gallery, Facebook Lock Ticker, Contextual Tag, Contextual Menu, Contextual Page Buddy, and other pleasant surprises of the Premium Suite Upgrade, and the fact that the hottest smartphone of 2012 is now coated with Liquipel protection, you have a phone that is an undeniable favorite. In my opinion, apart from the GS3’s 1GB of RAM and other specs that are not as high-end as 2013’s, Liquipel waterproof protection is the one thing that was missing from Samsung’s GS3. Now that Sony has turned things up a notch and made companies like Samsung and LG get serious about water protection, I think we’ll see the best of what Samsung has to offer. 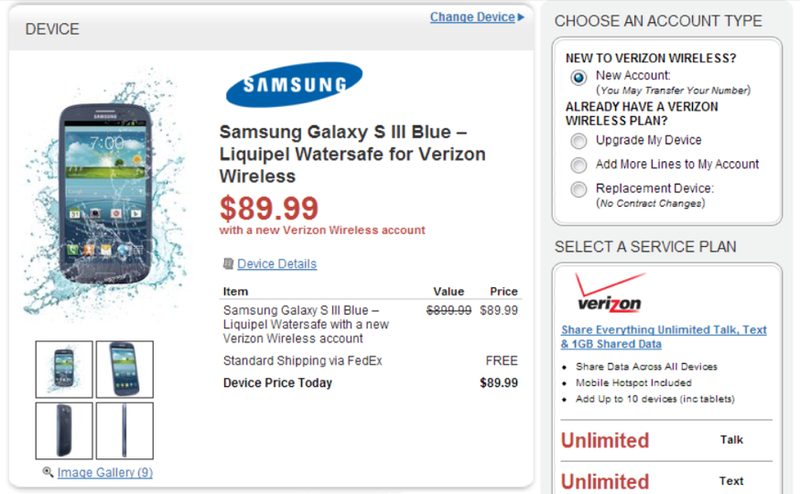 For those who want an affordable phone with water protection, the waterproof GS3 can be yours for $89.99. If you want to save even more money and do not care for a waterproof device, you can purchase an original GS3 and get a waterproof case from Seidio (the Seidio OBEX waterproof case, for example) to go with it. Visitwirefly.comfor more details.